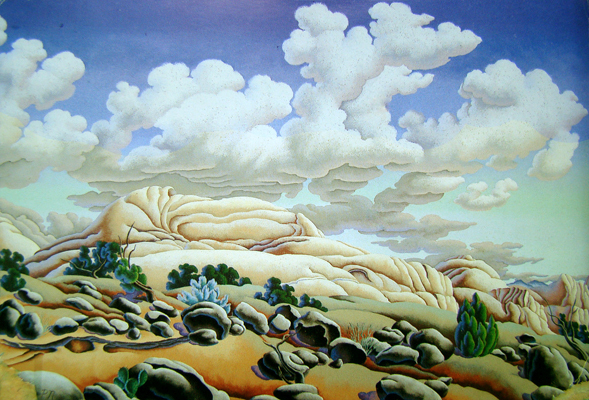 Paula Narbutovskih is an American artist specializing in vibrant desert landscapes of the American Southwest using a variety of media including oils, pastels and watercolors. Looking at Narbutovskih's paintings, you are immediately reminded of how things are connected in nature. You see the splendor and excitement of nature, the intensity of emotions that being in nature elicits. You will probably try to categorize her, which is difficult, since, although she is a representational painter in a sense, she infuses her work with a life force that goes beyond mere representation. Her paintings tend to evoke feelings in you that you only thought you would experience out in the fields, or canyons, or mesa tops. Although representational, her work seems to lean towards the dreamlike scenes that one would expect in surrealism.